In the past the Ninja name was used to designate the top-of-the-line Scythe coolers. Then somewhere along the development road the Infinity name rose to the top of the Scythe catalog. In the current Scythe lineup the two coolers are remarkably similar in features, but with slightly different design approaches to the cooling task. While both the Ninja and Infinity use 6 heatpipes for cooling in a tower arrangement, the Infinity is wider than it is thick and groups the heatpipes on the two sides of the fin array. 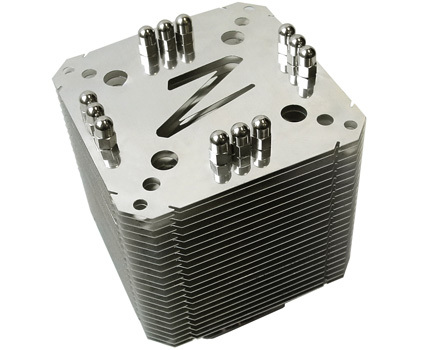 The Ninja, on the other hand, is square with three in-line heatpipes on each side of the square. One purpose of this review is to determine which of these design approaches is the most effective in cooling. It was also pointed out in our recent review of the OCZ Vindicator that the Vindicator looked like a relabeled Ninja Plus Rev. B. Looks, however, can be very deceiving and benchmarking the Ninja Plus B should provide better answers to the question of how similar the OCZ Vindicator and Ninja Plus B actually are. If the Ninja Plus B performs much better or much worse than the Vindicator tested with the same fan, then it is reasonable to assume the designs are really different. 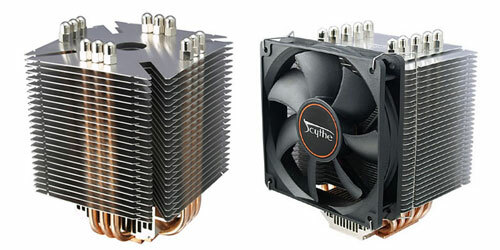 If performance is virtually the same, then it is reasonable to conclude that these are likely the same base cooler. There is no getting around the fact that the Scythe Ninja Plus B is a big cooler. Most of the heatpipe towers are huge, which is part of why they are effective. The good news is the fin array is raised enough that it clears the power transistor passive coolers, heatpipes, caps, and fans on every board we had in the lab. This even includes fitting on the ASUS Striker and Commando boards, which can be a challenge with their raised heatpipes and passive cooling sinks surrounding the CPU socket. There's not any room left on these ASUS boards to fit hands between the heatpipe ring of the board and the fin array of the Ninja Plus B, but you can mount and unmount the Ninja Plus B if you are careful and first remove the motherboard from the case.